Pickpockets can ruin the holidays the most promising. Fortunately, many preventive measures can be taken to help ensure a safe and carefree travel. Alex Tilley, designer hats and travel clothing Tilley, in collaboration with Ron Frederick, retired Detective of Police Services of Toronto, shared with me some safety tips regardless of the destination. I added my two cents of course! Basic principle: Do not spread large sums of money, jewelry or other objects that are or seem expensive. Spread your valuables in several places. Choose travel clothes similar to trousers, skirts and shorts that have pockets Tilley secret. Second rule: Do not leave your purse "yawn" covetousness. Get yourself a bag with multiple fasteners, safety. Pickpockets do not show their professions, many of them are very well dressed and cared for. Often difficult to recognize them! Follow your instincts. Pickpockets usually study their targets. If someone is following you, go in a safe place. If the surroundings do not inspire confidence, get you quickly to this situation. Beware of loud arguments, the clashes and other incidents. Do not play the curious. Pickpockets usually work in teams and often a disturbance to distract the victim while a partner makes the pockets. Pickpockets frequent bus stations and train stations, airports, the lobby of hotels, outdoor festivals, subway stations and other busy areas. If you see a sign "Beware of pickpockets", do not exclaim "Oh my God!" by placing your hand on your wallet. It is you who display "This is where I put my currency! The pickpockets rarely act alone. Surrounded by a group of children? Soar! Even in Paris, in some tourist areas, children come to surround you. They are charming and you say "Oh, the pretty Lady". All smiles, you do not see those who surround you and steal you from behind. Always keep your purse or your bag shoulder strap along the body, hands and forearms covering the front of the bag - does not need to be in a crowd for being robbed and some even work from of a moving car. For this reason, always walk on the bottom of the sidewalk, close your bag between your body and your arm toward the front of houses. Choose modest clothing and luggage, and leave your valuable jewelry at home. We must also think about jewelry razzle-l'oeil. I had a beautiful elephant head pendant. We tried to take me, yet it was only in gold metal. Your jewelry does not bear the label: Knock! Please refrain! It's the same for the glasses. Cartier you have? You are immediately spotted by pickpockets who specialize in designer glasses. It takes you down stairs in a split second and try to chase when ridership. They were not scared, believe me! Take as little luggage as possible. Travelers are overloaded even more attractive a target and you are slower to react. Buy luggage with wheels that allow you to move quickly without effort. Beware of the Good Samaritan who wants to help you carry your luggage. Walk with a firm step. Do not look vulnerable or lost. You're a tourist, yes, but have seemed to know where you go. You can redeem it and trust that usually discourages aggressors. Make a photocopy of your passport, credit cards and driver's license. Leave one copy with a friend and keep one another in your secret pocket. During your trip, do not give any information about your destination, your valuables or your itinerary for those who do not need them - desk attendants, doormen or taxi drivers. Never keep passport, return ticket, money, credit cards, documents in one bag, slide a portion of your cash, for example, in a money belt, leave your return ticket in the safe of your hotel etc.. Just bring the money you need for the day, and divide it among several pockets of security. 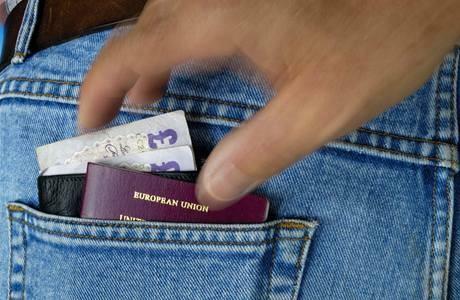 Avoid storing your wallet or passport in a back pocket. Use a money belt or pockets discreetly disguised to protect your valuables from potential pickpockets. A thief can easily cut the belt in a fabric bag hanging from the belt. Do not leave purses or backpacks unattended, even on the back of your chair in restaurants. Before taking public transportation, prepare your subscription card or travel money. This will prevent you from opening your bag and take money at a time when you are less attentive. Keep your hotel room key and your car keys separate from your handbag. If you are robbed your bag, you can still take your car and the thief will not know where you are staying. In the evening, stay in well-lit areas where other people. Nominal fee, many airports can pack your luggage or bag shrink. This helps to prevent manipulation and theft at the airport and even in the taxi, and it prevents the wear of your luggage. * In case of theft of passports or visas, contact your embassy. It is best to write down the phone number of your embassy in each country and region visited for not having to search if you need it. Do not panic after the listing of tips, but as the saying goes, better safe than sorry!